1.1 “Act” means the Securities and Exchange Board of India Act, 1992. 1.2 “Board” means the Board of Directors of the Company. 1.3 “Code” or “Code of Conduct” shall mean the Code of Internal Procedures and Conduct for Regulating, Monitoring and Reporting of trading by insiders of Mirza International Limited as amended from time to time. 1.4 “Company” means Mirza International Limited. 1.5 "Compliance Officer" means Company Secretary or such other Senior Officer, who is financially literate and is capable of appreciating requirements for legal and regulatory compliance under these regulations designated so and reporting to the Board of Directors and who shall be responsible for compliance of policies, procedures, maintenance of records, monitoring adherence to the rules for the preservation of Unpublished Price Sensitive Information, monitoring of trades and the implementation of the codes specified in these regulations under the overall supervision of the Board of Directors of the Company. (i) any person who is or has during the six months prior to the concerned act been associated with a Company, directly or indirectly, in any capacity including by reason of frequent communication with officers or by being in any contractual, fiduciary or employment relationship or by being a Director, Officer or an Employee of the Company or holds any position including a professional or business relationship between himself and the Company whether temporary or permanent, that allows such person, directly or indirectly, access to Unpublished Price Sensitive Information or is reasonably expected to allow such access. (j) a concern, firm, trust, Hindu Undivided Family, Company or Association of Persons wherein a Director of the Company or his immediate relative or Banker of the Company, has more than ten per cent, of the holding or interest. 1.7 “Dealing in Securities” means an act of subscribing to, buying, selling or agreeing to subscribe to, buy, sell or deal in the securities of the Company either as principal or agent. iii. Every employee in the corporate accounts, finance, secretarial, personnel and IT department as may be determined and informed by the Compliance Officer. iv. Any other employee as may be determined and informed by the Compliance officer from time to time. 1.9 “Director” means a member of the Board of Directors of the Company. 1.10 “Employee” means every employee of the Company including the Directors in the employment of the Company. 1.11 "Generally available information" means information that is accessible to the public on a non- discriminatory basis. 1.21 “Regulations” shall mean the Securities & Exchange Board of India (Prohibition of Insider Trading) Regulations, 2015 and any amendments thereto. 1.22 “Specified Persons” means the Directors, connected persons, the insiders, the Designated Employees and the promoters and immediate relatives are collectively referred to as Specified Persons. Words and expressions used and not defined in these regulations but defined in the Securities and Exchange Board of India Act, 1992 (15 of 1992), the Securities Contracts (Regulation) Act, 1956 (42 of 1956), the Depositories Act, 1996 (22 of 1996) or the Companies Act, 2013 (18 of 2013) and rules and regulations made there under shall have the meanings respectively assigned to them in those legislation. 2.1 The Compliance Officer shall report on insider trading to the Board of Directors of the Company and in particular, shall provide reports to the Chairman of the Audit Committee, if any, or to the Chairman of the Board of Directors at such frequency as may be stipulated by the Board of Directors. 2.2 The Compliance Officer shall assist all employees in addressing any clarifications regarding the Securities & Exchange Board of India (Prohibition of Insider Trading) Regulations, 2015 and the Company’s Code of Conduct. 3.1 All information shall be handled within the Company on a need-to-know basis and no Unpublished Price Sensitive Information shall be communicated to any person except in furtherance of the insider's legitimate purposes, performance of duties or discharge of his legal obligations. - not attracting the obligation to make an open offer under the takeover regulations but where the Board of Directors of the Company is of informed opinion that the proposed transaction is in the best interests of the Company and the information that constitute Unpublished Price Sensitive Information is disseminated to be made generally available at least two trading days prior to the proposed transaction being effected in such form as the Board of Directors may determine. (i) “need to know” basis means that Unpublished Price Sensitive Information should be disclosed only to those within the Company who need the information to discharge their duty and whose possession of such information will not give rise to a conflict of interest or appearance of misuse of the information. (ii) All non-public information directly received by any employee should immediately be reported to the head of the department. Files containing confidential information shall be kept secure. Computer files must have adequate security of login and password, etc. Employees and connected persons designated on the basis of their functional role ("Designated Persons") in the Company shall be governed by an internal code of conduct governing dealing in securities. An insider shall be entitle to formulate a trading plan for dealing in securities of the Company and present it to the Compliance Officer for approval and public disclosure pursuant to which trades may be carried out on his behalf in accordance with such plan. 4.3 The Compliance Officer shall consider the Trading Plan made as above and shall approve it forthwith. However, he shall be entitled to take express undertakings as may be necessary to enable such assessment and to approve and monitor the implementation of the plan as per provisions of the Regulations. 4.4 The Trading Plan once approved shall be irrevocable and the Insider shall mandatorily have to implement the plan, without being entitled to either deviate from it or to execute any trade in the securities outside the scope of the trading plan. However, the implementation of the trading plan shall not be commenced, if at the time of formulation of the plan, the Insider is in possession of any Unpublished Price Sensitive Information and the said information has not become generally available at the time of the commencement of implementation. The commencement of the Plan shall be deferred until such Unpublished Price Sensitive Information becomes generally available information. Further, the Insider shall also not be allowed to deal in securities of the Company, if the date of trading in securities of the Company, as per the approved Trading Plan, coincides with the date of closure of Trading Window announced by the Compliance Officer. 4.5 Upon approval of the trading plan, the compliance officer shall notify the plan to the Stock Exchange(s) on which the securities are listed. 5.1 (i) The trading period, i.e. the trading period of the stock exchanges, called ‘trading window”, is available for trading in the Company’s securities. (ii) The trading window shall be, inter alia, closed from the date on which the Company sends intimation to Stock Exchange(s) advising the date of the Board Meeting, up to 48 hours after the Price Sensitive Information is submitted to Stock Exchange(s). (iii) When the trading window is closed, the Specified Persons shall not trade in the Company’s securities in such period. (iv) All Specified Persons shall conduct all their dealings in the securities of the Company only in a valid trading window and shall not deal in any transaction involving the purchase or sale of the Company’s securities during the periods when the trading window is closed, as referred to in Point No. (ii) above or during any other period as may be specified by the Company from time to time. (v) In case of ESOPs, exercise of option may be allowed in the period when the trading window is closed. However, sale of shares allotted on exercise of ESOPs shall not be allowed when trading is closed. 5.2 The Compliance Officer shall intimate the closure of trading window to all the designated employees of the Company when he determines that a designated person or class of designated persons can reasonably be expected to have possession of Unpublished Price Sensitive Information. Such closure shall be imposed in relation to such securities to which such Unpublished Price Sensitive Information relates. 5.3 The Compliance Officer after taking into account various factors including the Unpublished Price Sensitive Information in question becoming generally available and being capable of assimilation by the market, shall decide the timing for re-opening of the trading window , however in any event it shall not be earlier than forty-eight hours after the information becomes generally available. 5.4 The trading window shall also be applicable to any person having contractual or fiduciary relation with the Company, such as auditors, accountancy firms, law firms, analysts, consultants etc., assisting or advising the Company. (i) An application may be made in the prescribed Form (Annexure 1) to the Compliance Officer indicating the estimated number of securities that the Specified Employee intends to deal in, the details as to the depository with which he has a security account, the details as to the securities in such depository mode and such other details as may be required by any rule made by the Company in this behalf. (ii) An undertaking (Annexure 2) shall be executed in favor of the Company by such Specified Employee incorporating, inter alia, the following clauses, as may be applicable. a) That the Employee/Director/Officer does not have any access or has not received “Price Sensitive Information” up to the time of signing the undertaking. b) That in case the Specified Employee has access to or receives “Price Sensitive Information” after the signing of the undertaking but before the execution of the transaction he/she shall inform the Compliance Officer of the change in his position and that he/she would completely refrain from dealing in the securities of the Company till the time such information becomes public. c) That he/she has not contravened the code of conduct for prevention of insider trading as notified by the Company from time to time. (d) That he/she has made a full and true disclosure in the matter. (iv) If the order is not executed within seven days after the approval is given, the Employee/Director must pre-clear the transaction again. (v) All Specified Persons who buy or sell any number of shares of the Company shall not enter into an opposite transaction i.e. sell or buy any number of shares during the next six months following the prior transaction. All Specified Persons shall also not take positions in derivative transactions in the shares of the Company at any time. In case of any contra trade be executed, inadvertently or otherwise, in violation of such a restriction, the profits from such trade shall be liable to be disgorged for remittance to the Securities and Exchange Board of India (SEBI) for credit to the Investor Protection and Education Fund administered by SEBI under the Act. In case of subscription in the primary market (initial public offers), the above mentioned entities shall hold their investments for a minimum period of 30 days. The holding period would commence when the securities are actually allotted. (vi) The Compliance Officer may waive off the holding period in case of sale of securities in personal emergency after recording reasons for the same. However, no such sale will be permitted when the Trading window is closed. 7.1 The disclosures to be made by any person under this Code shall include those relating to trading by such person's immediate relatives, and by any other person for whom such person takes trading decisions. 7.2 The disclosures of trading in securities shall also include trading in derivatives of securities and the traded value of the derivatives shall be taken into account for purposes of this Code. 7.3 The disclosures made under this Code shall be maintained for a period of five years. 8.1 Every Promoter/ Key Managerial Personnel / Director / Officers / Designated Employees of the Company, within thirty days of these regulations taking effect, shall forward to the Company the details of all holdings in securities of the Company presently held by them including the statement of holdings of dependent family members in Form A(Annexure 5). (b) the acquisition or sale of shares or voting rights, as the case may be. 9.1 Within 2 days of the receipt of intimation under Clause 8.3, the Compliance Officer shall disclose to all Stock Exchange(s) on which the Company is listed, the information received. 9.2 The Compliance officer shall maintain records of all the declarations in the appropriate form given by the Directors / Officers / Designated Employees for a minimum period of five years. 10.1 No information shall be passed by Specified Persons by way of making a recommendation for the purchase or sale of securities of the Company. • Only public information to be provided. • Develop best practice to make transcript or records of proceedings of meeting with analyst and other investor relations conference on the official website to ensure official confirmation and documentation of disclosures made. 11.1 Every Specified Person shall be individually responsible for complying with the provisions of the Code (including to the extent the provisions hereof are applicable to his/her dependents). 11.2 Any Specified Person who trades in securities or communicates any information for trading in securities, in contravention of this Code may be penalized and appropriate action may be taken by the Company. 11.3 Specified Persons who violate the Code shall also be subject to disciplinary action by the Company, which may include wage freeze, suspension, ineligibility for future participation in employee stock option plans, etc. 1. Prompt public disclosure of Unpublished Price Sensitive Information that would impact price discovery no sooner than credible and concrete information comes into being in order to make such information generally available. 2. Uniform and universal dissemination of Unpublished Price Sensitive to avoid selective disclosure. 3. Designation of a Senior Officer as a chief investor relations officer to deal with dissemination of information and disclosure of Unpublished Price Sensitive Information. 4. Prompt dissemination of Unpublished Price Sensitive Information that gets disclosed selectively, inadvertently or otherwise to make such information generally available. 5. Appropriate and fair response to queries on news reports and requests for verification of market rumors by regulatory authorities. 6. Ensuring that information shared with analysts and research personnel is not Unpublished Price Sensitive Information. 7. Developing best practices to make transcripts or records of proceedings of meetings with analysts and other investor relations conferences on the official website to ensure official confirmation and documentation of disclosures made. 8. Handling of all Unpublished Price Sensitive Information on a need-to-know basis. “MIRZA INTERNATIONAL LIMITED” aims at carrying out its business activities in an efficient and orderly manner. It ensures adherence and compliances with respect to various provisions framed by Regulatory Authorities from time to time. In View of this and also pursuant to provisions of Section 134 (5) (e) of the Companies Act, 2013, our Company has laid down Internal Financial Control Policy which helps in ensuring the orderly and efficient conduct of its business, including adherence to Company’s policies, the safeguarding of its assets, the prevention and detection of frauds and errors, the accuracy and completeness of the Accounting records and timely preparation of reliable financial information. "Audit Committee" means Committee of Board of Directors of the Company constituted under the provisions of the Companies Act, 2013 and the SEBI (LODR) Regulations, 2015. "Policy" means “Internal Financial Control Policy. Senior management, to be responsible for establishment of overall policies and active oversight of parameters and controls. Internal audit, to ensure that independent assessments are made encompassing functioning of various compliances under various statues and Rules & Regulations framed there under, adequate systems and procedures are at place for physical verification of stocks of raw materials, finished goods, stores and spare parts, work- in-progress, fixed assets and other assets, proper books of accounts, vouchers along with supports and other documents are maintained, confirmation of balances from debtors, creditors and other parties are obtained periodically/ at year end and proper systems and procedures are at place for internal control at various departments. Internal chek to ensure organization of the system of account under which the work of one person is automatically checked by another, with a view to prevent and detect the errors and frauds. Under such a system, it is not possible to commit errors & frauds without the collusion between to or more people. • To mitigate risks and provide reasonable assurance that operations are efficient and effective, assets are safeguarded. • A framework for an effective internal control system which conveys to managers that they are responsible for ensuring that internal controls are established, documented, maintained and adhered. • To ensure the propriety of transactions, information integrity, compliance with regulations and achievement of Company’s objectives through operational efficiency. The procedure of Internal finacial control begins with Identifying the Objectives, Performing risk assessment, Control Activities, Information and Communication and then Monitoring Activities. It helps in ensuring reliable financial reporting to its various stakeholders and also helps improves the overall confidence of its Stakeholders. It helps in achieving the objective of Compliances with various Rules and Regulations. It helps in exhibiting better Corporate Governance norms. It not only helps in detecting the error but also removes the chances of their occurance. Helps in bringing efficiency in operations. The above policy has been reviewed by the Audit Committee in terms Section 177 of the Companies Act, 2013. Pursuant to the provisions of Section 177 of the Companies Act, 2013 the Audit Commiittee may call for the comments of the Auditors about internal control systems, the scope of audit, including the observations of the auditors and review of financial statement before their submissions to the Board and may also discuss any related issues with the internal and statutory auditors and the management of the company. • The level and composition of remuneration is reasonable and sufficient to attract, retain and motivate Directors of the quality required to run the Company successfully. • Act means the Companies Act, 2013 and Rules framed there under, as amended from time to time. • Board means Board of Directors of the Company. • Directors mean Directors of the Company. Company Secretary; and such other officer as may be prescribed. • Senior Management means personnel of the Company who are members of its core management team excluding the Board of Directors including Functional Heads. b) To formulate criteria for evaluation of Independent Directors and the Board. c) To identify persons who qualify to become Directors and who may be appointed in Senior Management in accordance with the criteria laid down in this Policy. d) To carry out evaluation of every Director’s performance. e) To recommend to the Board for the appointment and removal of Directors, Key Managerial Personnel and Senior Management. f) To recommend to the Board policy relating to remuneration for Directors, Key Managerial Personnel and Senior Management. g) To ensure that level and composition of remuneration is reasonable and sufficient, Relationship of remuneration to performance is clear and meet appropriate performance benchmarks. h) To carry out any other function as is mandated by the Board from time to time and /or enforced by the statutory notification, amendment or modification, as may be applicable. i) To devise a policy on Board Diversity. k) To assist the Board in ensuring that plans are in place for orderly succession for appointments to the Board, Key Managerial Personnel and to Senior Management. The Chairperson of the Nomination and Remuneration Committee or, in his absence, any other member of the Committee authorised by him, shall be present at the General meetings of the Company, to answer the shareholders queries, if any. The Nomination and Remuneration Committee shall set up a mechanism to carry out its functions and is further authorized to delegate any / all of its powers to any of the Directors and /or Officers of the Company, as deemed necessary for proper and expeditious execution. a) The Committee shall identify and ascertain the integrity, qualification, expertise and experience of the person for appointment as Director, KMP or at Senior Management level and recommend to the Board his / her appointment. b) A person should possess adequate qualification, expertise and experience for the position he / she is considered for appointment. The Committee has discretion to decide whether qualification, expertise and experience possessed by a person is sufficient / satisfactory for the concerned position. b) Independent Director: An Independent Director shall hold office for a term up to five consecutive years on the Board of the Company and will be eligible for re-appointment on passing of a special resolution by the Company and disclosure of such appointment in the Board's report. - No Independent Director shall hold office for more than two consecutive terms, but such Independent Director shall be eligible for appointment after expiry of three years of ceasing to become an Independent Director. Provided that an Independent Director shall not, during the said period of three years, be appointed in or be associated with the Company in any other capacity, either directly or indirectly. However, if a person who has already served as an Independent Director for 5 years or more in the Company as on October 1, 2014 or such other date as may be determined by the Committee as per regulatory requirement; he/ she shall be eligible for appointment for one more term of 5 years only. a) The Remuneration / Compensation / Profit linked Incentive etc. to Managerial Personnel, KMP and Senior Management will be determined by the Committee and recommended to the Board for approval. The Remuneration / Compensation / Profit Linked Incentive etc. to be paid for Managerial Personnel shall be subject to the prior/post approval of the shareholders of the Company and Central Government, wherever required. b) The remuneration and commission to be paid to Managerial Personnel shall be as per the statutory provisions of the Companies Act, 2013, and the rules made there under for the time being in force. c) Managerial Personnel, KMP and Senior Management shall be eligible for a monthly remuneration as may be approved by the Board on the recommendation of the Committee in accordance with the statutory provisions of the Companies Act, 2013, and the rules made there under for the time being in force. The break-up of the pay scale and quantum of perquisites including, employer’s contribution to P.F, pension scheme, medical expenses, club fees etc. shall be decided and approved by the Board on the recommendation of the Committee and approved by the shareholders and Central Government, wherever required. d) If, in any financial year, the Company has no profits or its profits are inadequate, the Company shall pay remuneration to its Managerial Personnel in accordance with the provisions of Schedule V of the Companies Act, 2013 and if it is not able to comply with such provisions, with the prior approval of the Central Government. e) If any Managerial Personnel draws or receives, directly or indirectly by way of remuneration any such sums in excess of the limits prescribed under the Companies Act, 2013 or without the prior sanction of the Central Government, where required, he / she shall refund such sums to the Company and until such sum is refunded, hold it in trust for the Company. f) Increments if declared to the existing remuneration / compensation structure shall be recommended by the Committee to the Board which should be within the limits approved by the Shareholders in the case of Managerial Personnel. b) Sitting Fees: The Non- Executive / Independent Director may receive remuneration by way of fees for attending meetings of Board or Committee thereof. Provided that the amount of such fees shall not exceed the maximum amount as provided in the Companies Act, 2013, per meeting of the Board or Committee or such amount as may be prescribed by the Central Government from time to time. c) Limit of Remuneration /Profit Linked Commission: Remuneration /profit linked Commission may be paid within the monetary limit approved by shareholders, subject to the limit not exceeding 1%/3% of the net profits of the Company respectively. a) Evaluation: The Committee shall carry out evaluation of performance of every Managerial Personnel, Director, KMP and Senior Management on yearly basis. b) Removal: The Committee may recommend, to the Board with reasons recorded in writing, removal of a Managerial Personnel, Director, KMP or Senior Management subject to the provisions of Companies Act, 2013, and all other applicable Acts, Rules and Regulations, if any. c) Minutes of Committee Meeting: Proceedings of all meetings must be minuted and signed by the Chairperson of the said meeting or the Chairperson of the next succeeding meeting. Minutes of the Committee meeting will be circulated at the subsequent Board meeting for noting. The Board of Directors on its own and / or as per the recommendations of Nomination and Remuneration Committee can amend this Policy, as and when deemed fit. In case of any amendment(s), clarification(s), circular(s) etc. issued by the relevant authorities, not being consistent with the provisions laid down under this Policy, then such amendment(s), clarification(s), circular(s) etc. shall prevail upon the provisions hereunder and this Policy shall stand amended accordingly from the effective date as laid down under such amendment(s), Clarification, circular(s) etc. We believe that an effective Risk Management process is the key to sustained operations there by protecting the shareholder value, improving governance process, achieving strategic objective and being well prepared for adverse situation or unplanned circumstances, if they were to occur in life style of business activities. 1. Providing a framework that enables future activities to take place in consistent and controlled manner. 2. Improve decision making, planning and prioritization by comprehensive and structured understanding of business activities, volatility and opportunities /threats. 4. Protecting and enhancing assets and company image. 5. Reducing volatility in various areas of the business. 6. Developing and supporting people and knowledge base of organization. "Section 134(3) (n) - A statement indicating development and implementation of a Risk Management Policy for the Company including identification therein of elements of risk, if any, which in the opinion of the Board may threaten the existence of the Company." The Board of Directors of the Company shall periodically review and evaluate the Risk Management system of the Company so that the management controls the risks through properly defined network. Head of Departments shall be responsible for implementation of the risk management system as may be applicable to their respective areas of functioning and report to the Board. Audit Committee, shall be evaluated the Risk Management System. The Board shall define the roles and responsibilities of the Audit Committee. It may also delegate monitoring and reviewing of the risk management plan to the Committee and such other functions as it may deem fit. The key Risk Management practices include those relating to risk assessment, measurement, mitigation, monitoring, reporting and integration with strategy and business planning. Risk identification and assessment : Periodic assessment to identify significant risks for the Company and prioritizing the risks for action. Mechanisms for identification and prioritization of risks include risk survey, business risk environment scanning and focused discussions in Risk Management Committee. Risk survey of executives across units, functions is conducted before the annual strategy exercise. Risk register and internal audit findings also provide pointers for risk identification. Risk measurement, mitigation and monitoring : For top risks, dashboards are created that track external and internal indicators relevant for risks, so as to indicate the risk level. The trend line assessment of top risks, analysis of exposure and potential impact are carried out. Mitigation plans are finalized, owners are identified and progress of mitigation actions are monitored and reviewed. 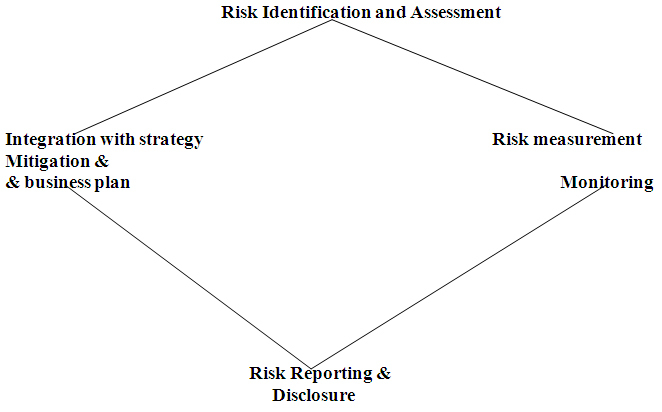 Risk Reporting : Top risks report outlining the risk level, trend line, exposure, potential impact and status of mitigation actions is discussed in Risk Management Committee on a periodic basis. In addition, risk update is provided to the Board. Entity level risks such as project risks, account level risks are reported to and discussed at appropriate levels of the organization. Integration with strategy and business planning : Identified risks are used as one of the key inputs for the development of strategy and business plan. 1. The Board shall be responsible for framing, implementing and monitoring the risk management plan for the Company. 2. The Board shall define the roles and responsibilities of the Audit Committee and may delegate monitoring and reviewing of the risk management plan to the Committee and such other functions as it may deem fit. 3. Ensure that the appropriate systems for Risk Management are in place. 4. The Independent Directors shall help in bringing an independent judgment to bear on the Board’s deliberations on issues of risk management and satisfy themselves that the systems of risk management are robust and defensible. 5. Participate in major decisions affecting the organization’s risk profile. 6. Have an awareness of and continually monitor the management of strategic risks. 7. Be satisfied that processes and controls are in place for managing less significant risks. 8. Be satisfied that an appropriate accountability framework is working whereby any delegation of risk is documented and performance can be monitored accordingly. 9. Ensure Risk Management is integrated into Board reporting and Annual reporting mechanisms. 10. Convene any Board-committees that are deemed necessary to ensure risk is adequately managed and resolved where possible. This Policy shall evolve through review of the Audit Committee and the Board from time to time as may be necessary. This Policy will be communicated to all vertical/functional heads and other concerned persons of the Company. Section 177 (9) & (10) of the Companies Act 2013 requires every Listed Company and such class of Companies, as may be prescribed to establish a Vigil Mechanism for the Directors and Employee to report genuine concern in such manner as may be prescribed. Regulation 22 of SEBI (LODR) Regulations, 2015 provides a requirement for all Listed Companies to establish a mechanism called Vigil (Whistle Blower) Mechanism for Director(s) and Employee(s) to report genuine concern about the unethical behavior, actual or suspected fraud or violation of the Companies Code of Conduct. This mechanism should also provide for adequate safeguard against victimization of Director(s) / Employee(s) who avail of the mechanism and also provide for direct access to the Chairman of the Audit Committee in exceptional cases. In compliance of above requirement MIRZA INTERNATIONAL LIMITED (MIL), being a Listed Company formulated a Vigil (Whistle Blower) Mechanism and also formulated a Policy for securing a Vigil Mechanism. The Vigil (Whistle Blower) Mechanism aims to provide a channel to the Directors and Employees to report a genuine concern about unethical behaviour, actual or suspected fraud or violation of Code of Conduct or Policy. The Company is committed to adhere to highest standards of ethical, moral and legal conduct of business operations and in order to maintain these standards, the Company encourages its Employees who have genuine concerns about the suspected misconduct to come forward and express these concerns without fear of punishment or unfair treatment. "Protected Disclosure" means a written communication of a concern made in good faith, which discloses or demonstrates information that may evidence an unethical or improper activity under the title "SCOPE OF THE POLICY" with respect to the Company. It should be factual and not speculative and should contain as much specific information as possible to allow for proper assessment of the nature and extent of the concern. "Vigilance Officer/Vigilance Committee or Committee" is a person or Committee of persons, nominated/appointed to receive protected disclosures from whistle blowers, maintaining records thereof, placing the same before the Audit Committee for its disposal and informing the Whistle Blower the result thereof. "Whistle Blower" is a Director or employee who makes a Protected Disclosure under this Policy and also referred in this policy as complainant. All Protected Disclosures should be reported in writing by the complainant as soon as possible, not later than 30 days after the Whistle Blower becomes aware of the same and should either be typed or written in a legible handwriting in English. The Protected Disclosure should be submitted under a covering letter signed by the complainant in a closed and secured envelope and should be super scribed as "Protected disclosure under the Whistle Blower policy" or sent through E-mail with the subject "Protected disclosure under the Whistle Blower policy". If the complaint is not super scribed and closed as mentioned above, the protected disclosure will be dealt with as if a normal disclosure. All Protected Disclosures should be addressed to the Vigilance Officer of the Company or to the Chairman of the Audit Committee in exceptional cases. Anonymous / Pseudonymous disclosure shall not be entertained by the Vigilance Officer. On receipt of the protected disclosure the Vigilance Officer shall detach the covering letter bearing the identity of the Whistle Blower and process only the Protected Disclosure. All Protected Disclosures under this Policy will be recorded and thoroughly investigated. The Vigilance Officer will carry out an investigation either himself/herself or by involving any other Officer of the Company/ Committee constituted for the same /an outside agency before referring the matter to the Audit Committee of the Company. A complainant who makes false allegations of unethical & improper practices or about alleged wrongful conduct of the Subject to the Vigilance Officer or the Audit Committee shall be subject to appropriate disciplinary action in accordance with the rules, procedures and policies of the Company. All reports and records associated with Disclosures are considered confidential information and access will be restricted to the Whistleblower, the Whistle Committee and Whistle Officer. Disclosures and any resulting investigations, reports or resulting actions will generally not be disclosed to the public except as required by any legal requirements or regulations or by any corporate policy in place at that time. The Board of Director of the Company are responsible for monitoring the affairs of the Company and making compliances with the various provisions of Companies Act, 2013; THIS WORD with SEBI (LODR) Regulations, 2015 and notifications and rules issued by the Stock Exchange from time to time. The Company's Board of Directors is dedicated to act in good faith; exercise their judgment on an informed basis and in the best interest of the Company and its stakeholders. The performance of every Director including the performance of the Board as a whole shall be assessed by the Board of Directors of the Company. Such an evaluation procedure will provide a fine system of checks and balances on the performance of the directors and will ensure that they exercise their powers in a rational manner. The criteria used and the process followed for the Performance Evaluation has been disclosed in the Policy. The Policy applies to Company's top management, every individual Director (whether be Executive or Non- Executive), Board of Director as a whole, and each and every Committee of the Board including Nomination and Remuneration Committee and Stakeholders Relationship Committee. B. "the Company" The Company shall mean Mirza International Limited. E. "the Policy" or this Policy : The Policy or this Policy shall mean the Policy for Evaluation of performance of Board of Directors of the Company. F. "the Committee" or this Committee ; The Committee or this Committee shall mean the Nomination and Remuneration Committee under section 178 of Companies Act, 2013. • discharge Director accountability to shareholders; and also keeps a check as to whether the Board of the Company is acting in the interest of all its stakeholders. • improve Director relationships with shareholders; fair evaluation of performance of the Board shall lead to a better relationship with its shareholders and also the investors complaints and requests would be addressed soon. • ensure Board harmony and dynamics; performance evaluation will lead to better interpersonal relationship and spirit of harmony and friendliness. • ensure Board processes are effective and efficient; the Policy shall also ensure that the process and procedures adopted to carry out the operations of the Company are effective. • add value to the Company; better performance of the Board would add value to the Company and will also build up better reputation in the business world. • anticipate issues that may affect the Company in the future; the Board shall take steps to minimise the negative risks associated with any activity. • Review Board Committee membership. The Nomination Committee shall lay down the evaluation criteria for performance evaluation of Independent Directors. The Company shall disclose the criteria for performance evaluation, as laid down by the Nomination Committee, in its Annual Report. The performance evaluation of Independent Directors shall be done by the entire Board of Directors (excluding the directors being evaluated). How well prepared and informed are they for Board Meetings and their meeting attendance satisfactory? Whether the Directors are adherencing to ethical standards & code of conduct of Company? Whether the Directors are maintaining good Interpersonal relations with other Directors and management? How actively and successfully do they refresh their knowledge and they are up to date with internal and external business conditions.? Whether they have understanding of the Company and the external environment in which it operates and contribution to strategic direction. Whether they are rendering valuable opinions and suggestions rendered by the Independent Directors of the Company during the Board Meeting. Based on the above criteria performance of the Independent Directors of the Company shall be assessed and on the basis of the report of performance evaluation, ratings shall be assigned to each and every Independent Director and it shall also be determined whether to extend or continue the terms of appointment of Independent Directors. Is the composition of the board appropriate with the right mix of knowledge and skills required to drive organizational performance in the light of future strategy? The Board of Directors is effective in establishing a corporate environment that promotes timely and effective disclosure, fiscal accountability, high ethical standards and compliance with applicable laws and regulations. The Board of Directors is effective in developing a corporate governance structure that allows and encourages the Board to fulfill its responsibilities. The Company’s systems of control are effective for identifying material risks and reporting material violations of policies and law and The Board is provided with sufficient information about material risks and problems that affects the Company’s business and prospects. The Board receives regular financial updates and takes all necessary steps to ensure the operations of the organization are sound and reviews the organization’s performance in carrying out the stated mission on a regular basis. Are sufficient numbers of Board Meetings, of appropriate length, being held to enable proper consideration of issues? The information provided to Directors prior to Board meetings meets expectations in terms of length and level of detail and Board members come prepared to meetings and ask appropriate questions of management and address issues that might present a conflict of interest. Assessment of performance shall be made on the basis of factors mentioned above and on the basis of the performance Ratings shall be assigned to every Director on individual basis and on tha basis of performance of the Board Committee as a whole. On the basis of this assessment the Nomination and Remuneration Committee shall identify persons who are qualified to become Directors and who may be appointed in Senior Management in accordance with the criteria laid down, recommend to the Board their appointment and removal and shall also carry out the evaluation of Directors performance. The performance evaluation process and related tools will be reviewed by the “Nomination and Remuneration Committee” on need basis, and the Committee may periodically seek independent external advice in relation to the process. The, committee may amend the Policy, if required, to ascertain its appropriateness as per the needs of the Company. The performance of Committees of Board shall also be reviewed from time to time. The Company will disclose details of its Board Performance Evaluation processes in the Board's Report. Our company's Policy has been to promote a healthy work environment that ensures every employee to be treated with dignity and respect and that enables employees to work without fear of prejudice, gender bias and sexual harassment. Sexual harassment at work place or other than work place if involving employees is an offence and is therefore punishable. This Policy applies to all categories of employees of company, including permanent management and workmen, temporaries, trainees and employees on contract at their workplace and includes business trips and business related social events. The company will not tolerate sexual harassment. A)"EMPLOYEE" means a person employed at a work place for anyone regular, temporary, ad hoc or daily wage basis, either directly or through an agent , including a contractor, with or without the knowledge of the principal employer, whether for remuneration or not or working on a voluntary basis or otherwise, whether the terms of employment are express or implied and includes a co-worker, a contractor worker, probationer, trainee, apprentice or called by any other such name. • Conduct of such an act at work place or outside in relation to an employee of MIRZA INTERNATIONAL, or vice versa during the course of employment. • Any unwelcome gesture by an employee having sexual overtones. A Committee has been constituted by the company to consider and redress complaints of sexual harassment. The chairman and member are as follows. • Investigating every formal complaint of sexual harassment. • Take appropriate remedial measures. • Preventing employment related sexual harassment. • Employee who feels and is being sexually harassed makes a formal complaint to the Presiding Officer within 30 days of the incident. • If employee is unable to make a complaint on account of mental or physical incapacity, the legal heir or such other person as may be prescribed will make a complaint. • The Committee, before initiating an enquiry, takes steps to settle between victim and respondent, through conciliation, provided that no monetary settlement shall be made as a basis of conciliation. • The committee will maintain a Register to record the complaint received and keep the contents confidential. • After receiving complaint Committee will hold a meeting with in 5 days. • The Committee Members shall hear the complainant and record her allegations. The complainant can also submit any corroborative material with a documentary proof, oral or written material, etc. • The person against whom complaint is made may be called for a deposition before the Committee and an opportunity will be given to him/her to give an explanation. • In the event the complaint does not fall under the purview of Sexual Harassment or the complaint does not mean an offence of Sexual Harassment, the same would be dropped after recording the reasons thereof. • In case the complaint is found to be false, the Complainant shall, if deemed	fit, be liable for appropriate disciplinary action by the Management. The Company understand that it is difficult for complainant to come forward with a complaint of matters related to sexual harassment so company will have all these matters confidential. All records of complaints, including contents of Meeting, results of investigations and other relevant material will be kept confidential by company. The Board of Directors of Mirza International Limited (the “Company”) in their Meeting held on 06th November 2015 has adopted the following Policy and procedures with regard to disclosure of material events which are necessary to be disclosed to the Stock Exchanges based on criteria as may be deemed necessary and has been adopted as part of this Policy. The Board may review and amend this Policy from time to time. This Policy will be applicable to the Company with effect from 1 December, 2015 is in terms of Clause 30 (8) of Chapter IV of Securities and Exchange Board of India (Listing Obligations and Disclosure Requirements) Regulations, 2015 (“LODR”). a. All Documents generated, disclosed or received by the Company, on its website, for the purpose of shareholder communication, are the properties of the Company and constitute archival material. b. Archival material of the Company shall not be destroyed or purged without the approval of Board of Directors. Provided that nothing contained herein shall be deemed to lead to an exception in case of an accidental deletion, or deletion due to any system flaw, virus, or any other deletion, inaccessibility or loss due to any reason other than deliberate and determinate deletion. c. Material so selected for preservation shall be sent to the Company archives in the category of archived documents. d. Board will be responsible for deciding how long archival material is to be retained in and under the direct control of the officer concerned, if the law does not specify any time period. The period shall not be less than 3 years. e. With reference to the pretext, the Documents submitted to the Stock Exchanges, to be hosted on the website for the purpose of compliance with disclosure norms shall also be archived. • Archiving of the Documents to be submitted to the Stock Exchanges, in terms of the Regulations, shall be done after the lapse of the preservation period of 5 years [as specified in Regulation 30(8)], as per the Archival Policy. The Company recognizes the importance and benefits of having the diverse Board to enhance the quality of its programme. The Company recognizes that a diverse Board will enhance the quality of decisions made by utilizing the different skills, qualification, professional experience, gender, knowledge etc. of the members of the Board, necessary for achieving sustainable and balance development. The Nomination and Remuneration Committee is responsible for reviewing and accessing the composition and performance of the Board. • Access the appropriate mix of diversity, skills, experience and expertise required on the Board and access the extent to which the required skills are represented on the Board. The total number of Directors constituting the Board shall be in accordance with the Law. The Board of Directors of the Company shall have an optimum combination of Executive and Non Executive Directors with at least one women Director and the composition of the Board shall be in accordance with the requirements of the Act, SEBI (Listing Obligations and Disclosure Requirements) Regulations, 2015 and as may be amended from time to time and the statutory, regulatory and contractual obligations of the Company. The Nomination and Remuneration Committee will review this Policy from time to time as necessary and make recommendations on any required changes to the Board for consideration and approval. This Policy has been approved by Board of Directors as on 6th November 2015. The Board of Directors of Mirza International Limited (the “Company”) has adopted the following Policy and procedures with regard to disclosure of material events which are necessary to be disclosed to the Stock Exchanges based on criteria as may be deemed necessary and has been adopted as part of this Policy. The Board may review and amend this Policy from time to time. This Policy will be applicable to the Company with effect from 1 December, 2015 is in terms of Clause 30 (4) of Chapter IV of Securities and Exchange Board of India (Listing Obligations and Disclosure Requirements) Regulations, 2015 (“LODR”). The purpose of this Policy is to determine materiality of events and information based on criteria specified under clause (i) of sub-regulation (4) of Regulation 30 of the Listing Regulations and to ensure that the Company shall make disclosure of events/information specified in Para A and B of Part A of Schedule III of the Listing Regulations to the Stock Exchanges. The Company shall consider the criteria as specified in clause (i) of sub-regulation 4 of Regulation 30 of the Listing Regulations for determination of materiality of events / information. Compliance Officer means The Officer appointed by the Board of Directors of the Company for the purpose of these Regulation from time to time. SEBI means Securities Exchange Board of India. Key Managerial Personnel (KMP) of the Company includes Managing / Whole-time Directors, Chief Financial Officer / Company Secretary, who may be authorised individually or collectively to disclose events to Stock Exchanges. 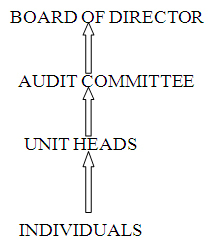 Based on the recommendation of the Audit Committee or suo moto the Board of Directors of the Company shall determine the events which are classified under different categories to be material and / or other events having a bearing on the performance of the Company and on the share prices of the Company, which needs to be disclosed to the Stock Exchanges as per the time span specified against each category. • Issuance or forfeiture of securities, split or consolidation of shares, buyback of securities any restriction on transferability of securities or alteration in terms or structure of existing securities including forfeiture, reissue of forfeited securities, alteration of calls, redemption of securities etc. Note: If the Management is not in a position to inform the Stock Exchanges within 24 hours of the decision taken at the Board Meeting, then it shall inform the Stock Exchanges as soon as it is possible with an explanation as to reason for delay in disclosing the said information. • Awarding, bagging / receiving, amendment or termination of awarded/ orders/ Contracts not in the normal course of business. The Management shall periodically bring to the attention of the Board of Directors of the Company, all information, events or materials which in its opinion has to be brought to the attention of the Members of the Stock Exchanges. Above details shall be also disclosed to the Stock Exchanges and as well as on Company’s website. The Company shall update all disclosures made under the Regulations to the Stock Exchanges in its website and shall be continued to be hosted in the website for a minimum period of five years and thereafter archived as per the document retention Policy of the Company. The Compliance Officer for the Purpose of complying with the provisions of LODR, 2015 shall be the Company Secretary of the Company. The Policy has been adopted and approved by the Board of Directors at its meeting held on 06th November, 2015 which shall be come into effect from 1st December 2015. The Board of Directors of Mirza International Limited (“the Company”) has adopted in their Meeting held on 06th November 2015 the following Policy and procedure with regard to preservation of documents as defined below. The Board will review and may amend this Policy from time to time. A Policy on preservation of documents involves the systematic identification, categorization, maintenance, review, retention and destruction of documents received or created in the course of business. The Policy contains the guidelines how to identify documents that need to be maintained, how long certain documents should be retained, how and when those documents should be disposed off if no longer needed, and how should be accessed or retrieved when they are needed as per the rules made there under the law. • Compliance Officer : The Company Secretary and / or a Key Managerial Person appointed by the Board of Directors of the Company as the Compliance Officer for the purpose of these Regulations from time to time. • SEBI : means The Securities Exchange Board of India. • Regulation : means Regulation made under SEBI Act. • Minutes of all General Meetings. • Shareholder and Joint venture Agreement. • Letter of Offer related to Public Issue, Right Issue, Further Issue, Buy Back Offer etc. • any others, if Board of Directors may deem fit. • Notice of the Board Meeting to the Stock Exchanges for considering matters relating to pre-intimations required to be submitted to the Stock Exchanges. • Date for the closures and Record dates for various purposes as may be decided by the Company from time to time. • Quarterly Shareholding Pattern including details for pledge of shares any changes therein. • Results of the E-voting, General Meetings, Postal Ballot etc. • Change in the constitution of the Board of Directors, KMP, Compliance Officer Auditors, Secretarial Auditors, Share Transfer Agent. • Recommendation and payment of Dividend to the Shareholders. • Details of the Complaints received and resolved by the Company. The above said documents shall be hosted by the Company on its website for a period at least 8 years. The Board of Directors may decide the preservation period for any particular documents. All the Employees in the permanent rolls of the Company are responsible for taking into account the potential impacts on preservation of documents in their work area and their decision to retain /preserve or destroy documents pertaining to their area. The Company Secretary is here by authorised by the Board of Directors shall be responsible for monitoring the Policy. The Authorised Person shall inform Board of Directors about the monitoring the Policy. The Authorised Person shall take necessary steps to discharge his duty. It is only through preservation that continued availability and access to items in the collection can be maintained. The following principles shall be kept in mind. • Where possible, documents are preserved in their original format, respecting the physical integrity and authenticity of the original documents. • Active conservation is employed when appropriate to prevent further deterioration or damage to an item, or to enable access to be given. • Appropriate conservation measures will take into account the needs, value, significance, and usage of the item in question. • Surrogates shall be created where appropriate to protect the original, and to allow wider access to the content, surrogates shall not replace the original, which will still need preservation. The Board shall ensure that all the documents shall keep in safe place in the Company premises. The Board may authorise person for security of documents, who shall be responsible for safe custody of documents. Disposal of documents after said period of 8 years (whose preservation shall not be permanent in nature shall be done in the presence of Authorised Person in the method prescribed by the Board of Directors, before disposing a soft copy shall be taken on record. The Board of Directors of the Company shall review the Policy on annual basis. The Authorised person shall provide regular assurance to Board of Directors on the effectiveness of Policy. • Strive for economic development that positively impacts the society at large with minimal resource footprint. • Embrace responsibility for the Company’s actions and encourage a positive impact through its activities on hunger, poverty, malnutrition, environment, communities, stakeholders and the society. The CSR projects and programs to be undertaken by the Company shall include activities falling within the preview of schedule VII of Companies Act, 2013; as amended from time to time. The surplus, if any, arising out of CSR initiatives of the Company shall not form part of its business profits and shall be utilized for CSR activities only. The CSR Committee will be responsible for overseeing the approval, execution, implementation and monitoring of the project. These programs will be executed by the Company and where appropriate in partnership with local government, various NGO partners, service providers and others. In case the Company undertakes to carry any of the projects through any trust, society or company not established by the Company or its holding or subsidiary or associate company, the CSR Committee shall ensure that such trust, society or Company has an established track record in undertaking similar programs or projects and is eligible to undertake the projects under Section 135 of the Act. The CSR Committee under the supervision of the Board shall try to ensure that the Company spends in each Financial Year (FY), at least two per cent of the average net profit (calculated as per Section 198 of the Act) made during the three immediately preceding FYs (CSR Budget). If the Company is unable to spend the prescribed 2% of its average net profit as mentioned above, the committee will review the reasons for the same and place the same with justification to the Board. The Company will report reasons for not spending the entire Budget outlay for CSR allocated in any financial year. To comply with the obligations, the CSR Committee may also decide to contribute amount of CSR Budget, either wholly or partially towards Corpus of any foundation provided under Schedule VII (as amended from time to time) as may be approved by the Board. To ensure effective implementation, the Committee will set measurable targets for each CSR project and Funds for such projects. The Board shall review, on quarterly basis, the CSR initiatives of the Company including amount spent thereon. The CSR Policy will be reviewed periodically by the CSR Committee of the Company. 2. All appropriate MIS are maintained, in a suggestive template. The details about the policy developed and implemented by the Company on corporate social responsibility, initiatives taken during the year and details of CSR spent during the financial year shall be disclosed in the Annual Report of the Company. This policy shall be subject to amendments under the Companies Act 2013 or any other applicable law or regulation. The Board of Directors (the “Board”) of Mirza International Limited (the "Company" or "MIL"), has adopted the following policy and procedures with regard to Related Party Transactions as defined below. The Audit Committee will review and may amend this policy from time to time. This policy will be applicable to the Company. This policy is to regulate transactions between the Company and its Related Parties based on the applicable laws and regulations applicable on the Company. This Policy is framed as per requirement of Regulation 23 of SEBI (LODR) Regulations, 2015 and intended to ensure the proper approval and reporting of transactions between the Company and its Related Parties. Such transactions are appropriate only if they are in the best interest of the Company and its shareholders. The Company is required to disclose each year in the Financial Statements certain transactions between the Company and Related Parties as well as policies concerning transactions with Related Parties. "Audit Committee or Committee" means Committee of Board of Directors of the Company constituted under provisions of SEBI (LODR) Regulations, 2015 and Companies Act, 2013. "Material Related Party Transaction" means a transaction with a related party if the transaction / transactions to be entered into individually or taken together with previous transactions during a financial year, exceeds ten percent of the annual consolidated turnover of the company as per the last audited financial statements of the Company. • Such entity is a related party under the applicable accounting standards." "Related Party Transaction" means any transaction directly or indirectly involving any Related Party which is a transfer of resources, services or obligations between a company and a related party, regardless of whether a price is charged. Explanation: A "transaction" with a Related Party shall be construed to include single transaction or a group of transactions in a contract. a) The Audit Committee shall lay down the criteria for granting the omnibus approval in line with the policy on Related Party Transactions of the Company and such approval shall be applicable in respect of transactions which are repetitive in nature. Provided that where the need for Related Party Transaction cannot be foreseen and aforesaid details are not available, Audit Committee may grant omnibus approval for such transactions subject to their value not exceeding Rs.1 crore per transaction. Such omnibus approvals shall be valid for a period not exceeding one year and shall require fresh approvals after the expiry of one year. Further, all Material Related Party Transactions shall require approval of the shareholders through special resolution and all entities falling under the definition of Related Parties shall abstain from voting irrespective of whether the entity is a party to the particular transaction or not. • Whether the terms of the Related Party Transaction are fair and on arms length basis to the Company and would apply on the same basis if the transaction did not involve a Related Party. • Whether there are any compelling business reasons for the Company to enter into the Related Party Transaction and the nature of alternative transactions, if any. • Whether the Related Party Transaction would affect the independence of an independent director. • Whether the proposed transaction includes any potential reputational risk issues that may arise as a result of or in connection with the proposed transaction. • Whether the Related Party Transaction would present an improper conflict of interest for any director or Key Managerial Personnel of the Company, taking into account the size of the transaction, the overall financial position of the director, Executive Officer or other Related Party, the direct or indirect nature of the director’s, Key Managerial Personnel’s or other Related Party’s interest in the transaction and the ongoing nature of any proposed relationship and any other factors the Board/Committee deems relevant. To review a Related Party Transaction, the Committee will be provided with all relevant material information of the Related Party Transaction, including the terms of the transaction, the business purpose of the transaction, the benefits to the Company and to the Related Party, and any other relevant matters. In determining whether to approve a Related Party Transaction, the Committee will consider the following factors, among others, to the extent relevant to the Related Party Transaction. Audit Committee shall review, at least on a quarterly basis, the details of Related Party Transactions entered into by the company pursuant to each of the omnibus approval given. Notwithstanding the foregoing, the following Related Party Transactions shall not require prior approval of Audit Committee or Shareholders. • Transactions entered into between the Company and its wholly owned subsidiary whose accounts are consolidated with the Company and placed before the shareholders at the general meeting for approval. • Any transaction that involves the providing of compensation to a director or Key Managerial Personnel in connection with his or her duties to the Company or any of its subsidiaries or associates, including the reimbursement of reasonable business and travel expenses incurred in the ordinary course of business. • Any transaction in which the Related Party’s interest arises solely from ownership of securities issued by the Company and all holders of such securities receive the same benefits pro rata as the Related Party. The Securities Exchange Board of India (SEBI) on July 8, 2016 has notified the SEBI (Listing Obligations and Disclosure Requirements) (Second Amendment) Regulations, 2016 (Regulations). Vide these Regulations, SEBI has inserted Regulation 43A after Regulation 43 of SEBI (Listing Obligations and Disclosure Requirements) Regulations, 2015, which requires top five hundred listed companies (based on market capitalization of every financial year) to formulate a Dividend Distribution Policy, which shall be disclosed in its Annual Report and on its website. However, listed entities other than top five hundred listed entities based on market capitalization may disclose their dividend distribution policies on a voluntary basis in their annual reports and on their websites. Mirza International Limited (the “Company”) though not fall under the list of the top five hundred listed companies as per the criteria mentioned above, but as a measure of good Corporate Governance initiative, the Company has approved and adopted this Dividend Distribution Policy (the “Policy”) at its meeting held on May 30, 2017, being the effective date of the Policy. The intent of the Policy is to broadly specify the external and internal factors including financial parameters that shall be considered while declaring dividend and the circumstances under which the shareholders of the Company may or may not expect dividend and how the retained earnings shall be utilized, etc. • Determination and declaration of dividend on preference shares, as and when issued by the Company, as the same will be as per the terms of issue approved by the shareholders. • Issue of Bonus Shares by the Company. The Policy is not an alternative to the decision of the Board for recommending dividend, which is made every year after taking into consideration all the relevant circumstances enumerated hereunder or other factors as may be decided as relevant by the Board. The Company is deeply committed to driving superior value creation for all its stakeholders. The focus will continue to be on sustainable returns, through an appropriate capital strategy for both medium term and longer term value creation. Accordingly, the Board would continue to adopt a progressive and dynamic dividend policy, ensuring the immediate as well as long term needs of the business. The Board will assess the Company’s financial requirements, including present and future organic and inorganic growth opportunities and other relevant factors (as mentioned elsewhere in this policy) and declare Dividend in any financial year. The Dividend for any financial year shall normally be paid out of the Company profits for that year. This will be arrived at after providing for depreciation in accordance with the provisions of the Companies Act, 2013. If circumstances require, the Board may also declare dividend out of accumulated profits of any previous financial year(s) in accordance with provisions of the Act and Regulations, as applicable. The Board may declare one or more Interim Dividends during the year. Additionally, the Board may recommend Final Dividend for the approval of the shareholders at the Annual General Meeting. The date of the Board meeting in which the Dividend proposal will be considered, will be provided to the stock exchanges, as required by Listing Regulations. Within these parameters, the Company would endeavor to maintain a total dividend pay-out ratio in the range of 15 to 20% of the profit after tax of the company excluding Dividend Distribution Tax. • Funding inorganic and organic growth needs including working capital, capital expenditure, repayment of debt, etc. The Board is authorized to change/amend this policy from time to time at its sole discretion and/or in pursuance of any amendments made in the Companies Act, 2013, the Regulations, etc. This document does not solicit investments in the Company’s securities. Nor is it an assurance of guaranteed returns (in any form), for investments in the Company’s equity shares.